There is nothing quite like the beauty of daffodil, lily or tulip plants heralding the start of springtime. Plan your next springtime garden with the tulip specialists at Tulips.com. Tulips.com is a division of Roozengaarde and Washington Bulb Company, Inc., the largest tulip bulb grower in the United States. Each of their healthy daffodil, tulip & specialty bulbs is selected for its exceptional beauty. Order your flower bulbs beginning in the spring and they'll be shipped to you just in time for fall planting. The following spring, the beauty of your new tulip plants and other bulb flowers will make your garden all you've ever imagined it could be. If you can't wait for the magic of your own daffodils, Dutch tulips or other flowers, Tulips.com also offers fresh cut flowers year round. Treat yourself or someone special to the glory of these symbols of springtime and renewal, or just enjoy their beauty while you shop the mail-order flower gardening catalog that guarantees healthy flowers springtime after springtime. Order your bulb catalog today and select bulk daffodils, iris, hyacinth or tulip bulbs, for fall planting. Whether you're looking for flower bulbs for gardening or want to send fresh cut flowers as a gift, you can't go wrong with Tulips.com. 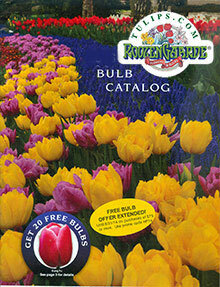 Orders can be placed securely on-line at their website or you can order from their free bulb gardening catalog. The biggest bulbs, for the most magnificent flowers every spring, direct from the grower - guaranteed.